The Hama Detached Palace Garden, or “Hamarikyu Onshi Teien Garden”, is a public park located at the mouth of the Sumida River. The park is a 250,000 m² or 62 acre landscaped garden surrounding a tidal pond, with the park itself surrounded by a seawater moat filled by Tokyo Bay. It was remodeled as a public garden park on the site of a villa of the Shogun Tokugawa family in the 17th century. The Palace grounds originally belonged to Matsudaira lord who filled in a portion of Tokyo Bay in the 17th century. The Matsudaira lord eventually gave the land to the Tokugawa Shogunate. In 1709, Tokugawa Ienobu, the sixth Shogun, erected a villa, and created gardens and ponds whose waters were continually cleaned by the flow of the tides. 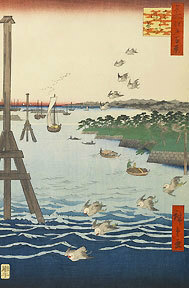 Tokugawa Ienobu loved duck hunting in the pond. At the end of the Tokugawa’s Shogunate rule, the grounds were taken over by the newly established Meiji government. A newly built brick house in the garden was used as an official state guesthouse. 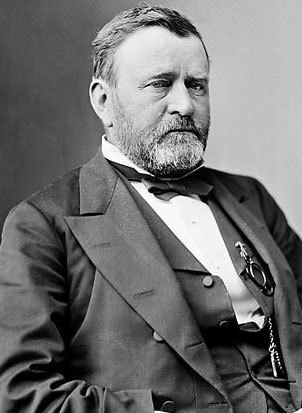 Former President Grant of the United States and his wife stayed in the house when they visited Japan in 1879. 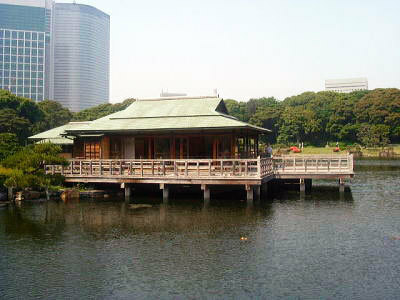 Emperor Meiji and the President met in a pavilion floating in the middle of the park pond. The Palace was passed to the City of Tokyo after WWII, and then turned into a public park. Later, the pavilion on an island in the middle of the larger pond, reminiscent of the one where the President and the Emperor met, has been rebuilt. 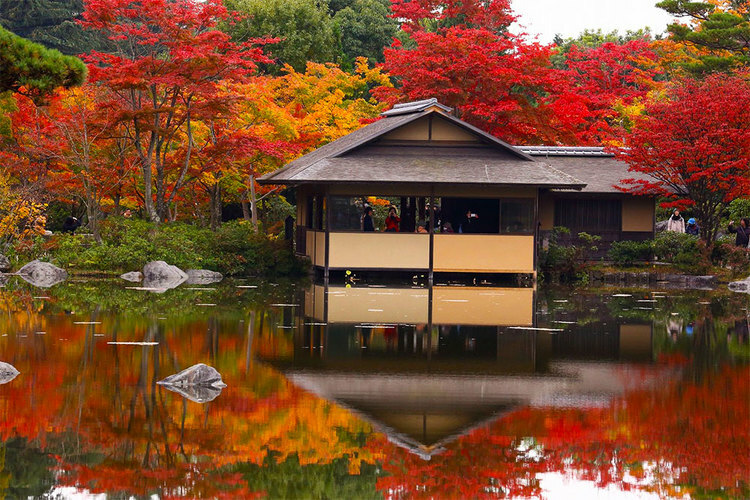 Currently, visitors can enjoy refreshments at a teahouse located in the middle of the pond that offers Matcha, or a Japanese green tea, and Japanese sweets in a tea-ceremony style.